At the beginning of each year, Van Ness Feldman produces an “Outlook” document that provides the thoughts of our professionals on key policy developments to expect in the major areas of our practice: energy, the environment, natural resources, transportation, and healthcare. The Outlook focuses on likely 2014 policy developments in Congress and the Executive Branch and focuses on key pending litigation. We hope that you find this document to be helpful and encourage you to contact the firm if you are interested in additional information on any issue covered in the Outlook. We believe there are several major themes that will drive federal policy development in 2014. The November mid-term elections, in which one-third of the Members of the United States Senate and all of the Members of the United States House of Representatives will be elected, will dominate the 2014 federal policy development process as the two political parties maneuver for political advantage. The focus will be on the United States Senate, where Republicans again have a chance to gain control of the Senate by picking up a total of six seats. At this point, continued Republican control of the House of Representatives seems secure. With the continuing gridlock in the United States Congress, most policy in the firm’s substantive areas of expertise likely will be made by the Executive Branch of the federal government under existing legal authorities. The enactment of a bipartisan comprehensive appropriations bill for FY2014 during the week of January 13th raises hopes that Congress could enact some bipartisan legislation in 2014. Congress will continue to be the forum for national debates on important policy issues in our law firm’s major practice areas, whether or not final action occurs in 2014. A continuing resolution (CR) is likely to fund the government from the beginning of FY2015 (October 1, 2014) to some point beyond the national elections. While significant debate is expected to occur in February regarding whether or not the national debt ceiling will be raised, the debt ceiling is expected to be raised a sufficient amount to prevent the need to revisit this issue before the November elections. Thus, no government shut-downs or federal government credit defaults are expected in 2014. Finally, a rare shift in Senate Committee Chairmanships mid-way in a Congress will occur in February 2014. Before Christmas, the President nominated Senator Max Baucus (D-MT) to be Ambassador to China. Senator Baucus is expected to be confirmed in this job by mid-February, and when he leaves the Senate and his Senate Finance Committee chairmanship, the current Chairman of the Senate Energy and Natural Resources Committee, Senator Ron Wyden (D-OR), will leave that post and become chairman of the Senate Finance Committee. When Senator Wyden leaves his Senate Energy and Natural Resources Committee chairmanship, Senator Mary Landrieu (D-LA) will become chairman of the Senate Energy and Natural Resources Committee. Finally, when Senator Landrieu leaves her Small Business and Entrepreneurship Committee chairmanship, Senator Maria Cantwell (D-WA) will assume that chairmanship. These changes in chairmanships are likely to change the agendas and work plans of each of these committees. 2014 appears to be another volatile year for the biofuels industry as serious legislative and regulatory threats to the biofuels sector are actively being considered by policymakers. Beyond defending itself from critics and competitors, the biofuels industry is also looking to the Farm Bill, the Department of Defense, and the tax reform debate to provide incentives and programs to support biofuels technology development, facilities and production. Legislative initiatives to repeal or alter the Renewable Fuels Standard (RFS) program, which was established in the Energy Policy Act of 2005, gained momentum in 2013 and will maintain momentum in 2014. At this time, however, it is uncertain whether there will be a legislative opportunity or sufficient bipartisan support to adopt legislation to repeal or alter the RFS. Despite stated support for the RFS, the Administration dealt the industry a serious political setback last November when the Environmental Protection Agency moved to reduce significantly the 2014 required volumetric obligations (RVO) under the RFS. Opponents of the RFS, including the American Petroleum Institute, are expected to increase pressure on the RFS on Capitol Hill, in court challenges, and through the EPA annual RVO process noted above. RFS critics will continue to raise concerns that the RVOs are pushing transportation fuels to the “blend wall”. Obtaining funding for an energy title in the Farm Bill continues to be of interest to many biofuels supporters including feedstock producers and technology developers. Even if the tax reform debate does not occur in 2014, the debate over extending expired energy tax benefits is already active in 2014. Key biofuels tax incentives expired at the end of 2013, including the second generation biofuel producer tax credit, the special depreciation allowance for second generation biofuel plant property, the biodiesel and renewable diesel fuels credits, and the alternative fuel and alternative fuel mixture excise tax credits. A key objective of the biofuels industry in either the tax reform or tax extenders debate is longer lasting federal tax benefits to assist the industry to achieve longer-term stability. A long-awaited rulemaking to redefine the scope of “waters of the United States” under the Clean Water Act (CWA) continues to move forward, with a proposed rulemaking possible in 2014. It is anticipated that the proposed rule refining the description of “waters of the United States” will expand significantly the universe of streams, wetlands, and other waters that would be considered jurisdictional waters of the United States for purposes of the CWA. This critical definition or description will determine when the permitting, enforcement, and citizen suit regimes of the CWA are activated. In mid-September 2013, EPA and the U.S. Army Corps of Engineers (USACE) announced the transmittal of a draft proposed rule to the Office of Management and Budget (OMB) for review. According to a version of the rule obtained by and released in the trade press, the draft proposed rule would make three substantial changes to the definition of “waters of the United States.” First, the agencies, EPA and USACE, would be authorized to find that there is a significant nexus between “all” tributaries and downstream traditional navigable waters and interstate waters so that all tributaries would be “jurisdictional by rule.” This means that a case-specific significant nexus determination would not be conducted for tributaries. Second, the draft rule would expand the “adjacency” inquiry from “adjacent wetlands” to “adjacent waters.” Third, the draft rule would make a preliminary finding that all non-adjacent “other waters” would continue to require a case-specific significant nexus analysis. The Administration’s efforts to define “waters of the United States” through policies, guidance and regulations have been highly controversial in Congress, and prior efforts have been the subject of legislative “riders” in prior appropriations bills. Initiation of a proposed rulemaking will further spotlight this issue and its implications for the jurisdictional reach of various federal regulatory programs that apply in “waters of the United States” such as the permitting requirements for “dredge and fill” activities in “waters of the United States” under Section 404 of the CWA. The position limits fight will take center stage, and personnel changes could impact the CFTC’s approach to regulation. With the Dodd-Frank Wall Street Reform and Consumer Protection Act (Dodd-Frank Act) now more than three years old, Dodd-Frank regulatory compliance has now become a reality for energy companies and their customers. In 2013, recordkeeping and reporting requirements for energy “swaps” transactions took effect. In 2014, energy companies will grapple with additional exemptive “end-user” reporting obligations such as initial trade option reports due March 1, 2014. We expect the CFTC to finalize its third attempt at positions limits for energy commodities, despite the ongoing objections of industry, and to focus on clearing and margining requirements that will affect energy companies. Now that the CFTC and FERC have signed memoranda of understanding on information sharing and jurisdiction, coordinated enforcement actions that span both physical and financial energy markets could become more frequent. The departure of Chairman Gary Gensler at the end of 2013, along with Commissioner Bart Chilton’s announcement that he will step down soon, means that the CFTC could chart a significantly different course in 2014. The President has nominated as the new Chairman of the Commission Timothy Massad, an experienced regulator from the Department of the Treasury. Additional CFTC nominees include Christopher Giancarlo to succeed Commissioner Jill Sommers and Shari Bowen to succeed Commissioner Bart Chilton. The Senate Agriculture Committee is expected to hold confirmation hearings for these nominees in the first quarter of 2014. Congress is also expected this year to consider reauthorization of the Commodity Exchange Act, which expired September 30, 2013. Expect a focus on local permitting, federal safety standards, and operational issues that could reduce crude by rail accidents. With the recent surge of domestic oil production from oil shale reserves, companies are increasingly turning to rail as a means of delivering crude to refineries throughout the country. This increased reliance on rail has led to a myriad of legal and regulatory issues involving federal, state and local jurisdictions and agencies that will continue to play out in rulemaking activities, environmental reviews and permitting decisions for infrastructure projects, as well as in litigation, in 2014. We expect continued activity on new regulatory safety initiatives, prompted in no small part by three recent high-profile accidents involving oil trains, including an accident in Lac-Megantic, Quebec in July 2013 that resulted in 47 deaths. In September 2013, PHMSA issued an Advanced Notice of Proposed Rulemaking seeking comments on several potential changes to its rail car standards, including tougher design requirements for the DOT-111 cars commonly used to move crude oil. Questions remain about whether any changes will apply to existing, as well as new, DOT-111 cars. On January 16th, after a meeting of railroads, tank car manufacturers and oil producers with the Secretary of Transportation and others from the department, the railroads and oil producers announced that they would take several voluntary actions to address the crude by rail safety issue. Reportedly under the agreement, the parties will comply voluntarily with the pending safety rules of the Department of Transportation, and the railroads will attempt to re-route crude oil traffic away from populated areas and take other measures to reduce the risk of accidents. Additionally, local, state and federal regulatory agencies will wrestle with a variety of complex issues as applications for marine port terminals in the Pacific Northwest continue to be considered. We expect a number of Congressional hearings and Congressional inquiries and a general increase in public debate in 2014 over the safety of crude oil movement by rail in light of the large number of crude by rail accidents that continue to occur around the nation. Legislative activity is possible in 2014 to promote information sharing between the government and private sector in order to increase preparedness for cybersecurity incidents. Last year saw the issuance of Executive Order 13636, Improving Critical Infrastructure Cybersecurity and Presidential Policy Directive-21, Critical Infrastructure Security and Resilience. Under the guidance of the National Institute of Standards and Technology (NIST), a preliminary Cybersecurity Framework was created through a collaborative process involving four workshops. The Framework is a voluntary set of standards, guidelines, and best practices to promote the protection of critical infrastructure. Security experts continue to sound alarms about the vulnerability of American infrastructure and the insecure design of the control systems that operate critical assets. The Edward Snowden affair and National Security Agency disclosures have decreased the likelihood of reforms to speed the security clearance processes. The classified documents released by Snowden shed light on what many believe to be the government’s offensive use of cyber vulnerabilities, a concern for many persons sharing information on vulnerabilities with government agencies. In Congress, despite bipartisan support for cybersecurity legislation, no bill passed both Houses last year. The Cybersecurity Information Sharing and Protection Act (CISPA) passed the House of Representatives in April 2013 as H.R. 624, but the Senate has not yet brought cybersecurity legislation to the full Senate for consideration. FERC and the North American Electric Reliability Corporation have remained active in advancing critical infrastructure protection reliability standards for FERC-jurisdictional electric utilities and expanded the scope of assets subject to mandatory reliability requirements in Critical Infrastructure Protection (CIP) version 5. In 2014, we expect additional disclosures of cybersecurity risks resulting from the disclosure of NSA documents, additional legislative initiatives to focus on information sharing and liability protection and to provide some financial grants and other incentives for electric, natural gas, hydropower, and oil pipeline infrastructure to increase cybersecurity protection for critical assets. There will be at least one and perhaps two special funding opportunities for the five Gulf Coast states that experienced damage from the Deepwater Horizon oil well blow-out in 2010: Texas, Louisiana, Mississippi, Alabama, and Florida. In a plea bargain of the multiple criminal charges brought against BP, Deepwater Horizon and Halliburton by the federal government for violating environmental statutes during the blow-out, the companies agreed to pay $2.54 billion into a Gulf Environmental Benefit Fund administered by the National Fish and Wildlife Foundation under the supervision of the United States District Court for the Eastern District of Louisiana. The funds may be used by these five states for coastal environmental restoration, not necessarily directly related to the damage caused to the coast by the 2010 oil well blow-out. In 2014, the funds available from this fund for these five states will be: Texas, $28.24 million; Louisiana, $176.50 million; Mississippi, $49.42 million; Alabama, $49.42 million; and Florida, $49.42 million. These Gulf Coast states may also be able to avail themselves of funds in 2014 through the Resources and Ecosystems Sustainability, Tourism Opportunity and Renewed Economy of the Gulf Coast Act of 2012 (RESTORE Act), which was enacted June 29, 2012. The RESTORE Act will be funded by 80% of the civil penalties paid to the federal government by the three companies for violations of the Clean Water Act during the well blow-out. These funds will be distributed to the five affected Gulf Coast states for a wide variety of uses. Proposed regulations to implement the RESTORE Act were issued for public comment by the Department of the Treasury September 6, 2013, with all comments due November 12, 2013. Final regulations have not yet been issued. No Clean Water Act penalties have yet been collected from these companies. The payment of these funds is expected to be the product of a final settlement between the federal government and the three companies. If a settlement is reached and funds are paid in 2014, the RESTORE Act could be a source of special funding for these five states in 2014. DOD is transforming the way it is using energy and views reliable, secure, and domestic supplies of energy as necessary to support its mission to protect the nation. Each branch of the military is engaged actively in efforts to reduce their energy consumption, to “island” their bases or make them independent from the grid through the adoption of microgrids and “smart” energy technologies, to privatize installation utilities, and to procure renewable electricity to power their bases. These DOD initiatives present unique opportunities for all segments of the energy industry, including energy technology developers, electricity providers, project developers, and investors. DOD is engaged actively in efforts to procure renewable electricity at U.S. military bases before 2020. In 2012, President Obama directed DOD to procure 3 gigawatts (GW) of renewable electricity on military installations across the country. While each branch of the military is approaching their renewable energy goals differently, it is clear that DOD does not intend to own or operate all the renewable generation assets. Rather, the recent DOD approach is to contract on a long-term basis for the electricity output. DOD has the authority to enter into 30-year power purchase agreements (PPAs), although the PPAs are limited to pricing authority and other DOD procurement regulations. An entity wishing to capitalize on these DOD opportunities must understand how to develop energy projects and should engage early at the federal and DOD installation level. FERC will focus on financial returns, transmission grid investment, and capacity market issues. FERC has pending before it a growing list of complaints concerning transmission formula rates, with complainants arguing that the return on equity in existing formula rates is too high under current financial market conditions. The complaints, if granted, could lead to significant reductions in transmission rates. The first of these cases to reach the full Commission, involving transmission rates in New England, is now fully briefed and ready for decision. In addition to party-specific cases, several groups have proposed that FERC undertake a generic proceeding to review and revise its policies for setting return on equity. FERC and transmission providers will move forward with implementation of Order No. 1000, a 2011 rule requiring transmission providers to work together within regions, and across regions, to plan new transmission facilities and allocate their costs. The next steps involve FERC action on compliance filings designed to support better coordination of transmission planning across regional boundaries. Challenges to Order No. 1000 will be heard in the D.C. Circuit in 2014. Stresses concerning the capacity markets in the Regional Transmission Organizations (RTOs) continue to plague the sector. There are questions about whether current structures are providing effective incentives for investment in new resources, and whether the resulting consumer price impacts are reasonable. FERC has undertaken a generic proceeding to consider capacity market issues. In November 2013, Acting Chairman Cheryl LaFleur took the helm at FERC, but there is an empty slot on the Commission. After the failed effort to confirm Administration nominee and Coloradan Ron Binz, 2014 will bring another effort to fill the vacant seat, along with questions as to who will serve as Chairman of the Commission once the vacancy is filled. Listing decisions and anticipated rulemakings likely will drive policy engagement on the ESA for 2014. The U.S. Fish and Wildlife Service (FWS) will continue a controversial review of listing and critical habitat decisions under the ESA. Under a court settlement, FWS must complete a review of over 250 candidate species for listing and potential critical habitat designations, plus review listing petitions for an additional 1,000 species by 2016. In the past two years, FWS already has increased the total number of species protected under the ESA by 145 species, which is a 10% increase in the number of listed species. FWS’s regulatory agenda targets over 200 more species for listing and critical habitat decisions in 2014, and among the most closely watched will be a March 2014 decision on the listing of the lesser prairie chicken in five Southwestern states. Another high-profile issue is the effort by the Department of the Interior to implement land management plans and encourage voluntary conservation efforts for the greater sage grouse before a listing decision must be made in 2015. Several ESA-related rulemakings also are anticipated in 2014. Two potential proposals stand out. First, a proposed rulemaking to define “adverse modification” of critical habitat as used in Section 7 consultations is reported to be in final internal review by the Department. In addition, proposed rulemakings are expected in 2014 on voluntary conservation efforts for candidate and listed species. Congressional committees will continue their oversight of the FWS listing decisions as well as the Administration’s overall implementation of the ESA. In 2014, there also could be attempts to move targeted legislation related to “sue and settle” actions, the analysis of economic impacts of listing species and critical habitat designations and voluntary conservation efforts. Bipartisan support for energy efficiency has emerged as a tool for addressing multiple economic and energy issues. The President included energy efficiency measures as a key part of the Administration’s Climate Action Plan, and DOE continues to pursue rulemakings to strengthen minimum efficiency standards for appliances and other energy-consuming equipment. DOE is also pursuing an active program of enforcement of these efficiency standards and has, for the first time, imposed large civil penalties in excess of $1 million on manufacturers of noncompliant products. We expect a lively debate in the coming year about whether and how end-use energy efficiency should be considered in EPA’s rulemaking on regulation of greenhouse gas emissions from existing power plants under section 111(d) of the Clean Air Act. The Administration’s schedule calls for EPA to issue a proposed rule under section 111(d) in June 2014 and a final rule in June 2015, and for State compliance plans, which would ultimately control how efficiency is considered, to be submitted in June 2016. In Congress, the Senate considered but failed to enact energy efficiency legislation co-sponsored by Senators Jeanne Shaheen (D-NH) and Rob Portman (R-OH) in 2013. Further efforts to pass this bill providing incentives for building efficiency investments are expected to be made in 2014. While the most intense energy debate in 2014 may focus on whether the United States should permit the export of crude oil, we expect continued strong interest in natural gas and coal exports as well. The relatively sudden abundance of fossil fuel resources in the nation is fueling the current export debate. No changes to current laws affecting crude oil exports are likely to be enacted in 2014, but the debate over possible changes has officially started and is likely to intensify. In December 2013, Secretary of Energy Ernie Moniz suggested that current restrictions on crude oil exports should be reviewed, while noting that the Department of Commerce, not the Department of Energy (DOE), has jurisdiction over such exports. As part of the review of the current federal policy on crude oil exports, Senator Lisa Murkowski (R-AK), Ranking Minority Member of the Senate Energy and Natural Resources Committee, released a white paper on January 2, 2014, entitled, “A Signal to the World: Renovating the Architecture of U.S. Energy Exports.” The Murkowski white paper described the current status of export regulations on various energy products and offered recommendations for regulatory changes to modernize and capitalize on the current abundant crude oil resources of the nation. While Senator Murkowski favors lifting barriers to crude oil exports, key House Republicans and Democrats in both Houses of Congress have expressed more caution. It is unlikely that Congress will enact legislation modifying the crude oil regulations in 2014, but the case for and against such action will be developed in 2014 through briefings, studies, hearings, and Congressional and Executive Branch focus on the subject. The pace of regulatory review at DOE and FERC remains uncertain. However, it is still very possible that at least three to four U.S. liquefied natural gas (LNG) export terminals could gain approval in time to be operational by 2017. As of January 14, 2014, DOE has issued conditional approval of the export of 6.7 billion cubic feet per day (bcf/d) of LNG. DOE is expected to continue to review applications for exports of LNG to countries with which the United States does not have a free trade agreement (non-FTA countries) in the order the applications appear in the so-called DOE queue. Although DOE generally has taken eight weeks between posting application approvals, there is a chance the pace of review could slow in 2014 as the volume of non-FTA export approvals increase. There is some speculation that DOE may take another formal or informal pause after approving 10-12 bcf/d of non-FTA exports. During any such pause, Executive Branch departments could be expected to examine outstanding issues like the applicable public interest criteria, how cumulative impacts of multiple approvals will be measured, or the order of precedence in the queue. If a slowdown in the processing of LNG exports to non-FTA countries were to occur, it could affect efforts by U.S. negotiators working on free trade agreements with Asian countries on the Trans-Pacific Partnership (TPP) and European countries on the Transatlantic Trade and Investment Partnership (TTIP). In addition to obtaining DOE approval of proposed LNG exports, applicants must also obtain the approval of FERC to site, construct, and operate LNG export facilities. FERC is the lead agency for coordinating the input of other relevant agencies, like the Department of Transportation’s Pipeline and Hazardous Materials Safety Administration (PHMSA) regarding safety design. FERC also manages all required National Environmental Policy Act reviews. Opponents of LNG exports are expected to continue to demand that NEPA considerations include not only the facility footprint, but also the entire possible lifecycle footprint related to the facility (such as natural gas production practices in the case of LNG terminals). 2013 marked another year of significant exports of U.S. coal, the biggest customer being China. While there are still proposed projects for the expansion and development of coal terminals along the East and West coasts, expansion ambitions are expected to decline in 2014 if export coal prices do not support large-scale export facilities. In addition to possible weakening demand abroad, coal terminals also face strong opposition from environmental groups. EPA has signaled that it wants agencies, like the Army Corps of Engineers, that must prepare an Environmental Impact Statement (EIS) for a coal terminal to consider not only the direct impacts of a facility but also the potential impacts along the full route associated with the transportation of coal to the terminal. EPA also indicated that the reviewing agency should consider the effects on the United States of pollution associated with coal combusted abroad. (See EPA Nov. 18 letter). Expect EPA to establish new emission standards for light-duty vehicles and lower gasoline sulfur content standards. EPA is set to issue a final rule establishing more stringent emission standards for light-duty vehicles and reducing the amount of sulfur in U.S. gasoline. EPA proposed the “Control of Air Pollution from Motor Vehicles: Tier 3 Motor Vehicle Emission and Fuel Standards” (the Tier 3 program) in May 2013. Originally scheduled for release by the end of 2013, the final Tier 3 program has been pushed back to February 2014 (possibly even later) due to the vast number of comments received and delays caused by the federal government shut down in October. The Tier 3 program will set standards to reduce exhaust and evaporative emissions from light-duty vehicles and align the federal standards with the Low Emission Vehicle (LEV) 3 emission standards that were adopted by California in 2012. The lower sulfur fuel will allow vehicle manufacturers to meet the new, more stringent tailpipe standards. Critics argue that the changes to the gasoline specifications will result in higher gas prices for consumers. EPA is also expected to begin work on the next round of greenhouse gas/fuel economy standards for heavy-duty vehicles and engines. 2014 will see the finalization of a number of pending EPA regulations that will impact operations at power plants, and also important court decisions on major EPA regulatory initiatives. Pursuant to the President’s Climate Action Plan, EPA likely will finalize limits on CO2 emissions from new power plants. The agency will also propose guidelines for states to develop CO2 limits for existing power plants. As for the current GHG permitting requirements, the U.S. Supreme Court will decide in 2014 whether regulation of GHG emissions from mobile sources triggers GHG permitting requirements for power plants and other stationary sources. Other rules EPA is likely to finalize in 2014 include a rule addressing cooling water intake structures, updated federal effluent limitation guidelines, and a rule governing the handling of coal combustion residuals (coal ash). Compliance costs associated with these rules could be significant. While coal-fired and oil-fired power plants will be in the middle of the three-year compliance window for the Mercury and Air Toxics Standards rule, the D.C. Circuit will decide in 2014 whether EPA properly set those standards. Also anticipated is a decision from the Supreme Court on the Cross-State Air Pollution Rule. How the Court resolves this matter will have important implications given the growing pressure by downwind states for EPA to take action against upwind states, and also the possibility that EPA will further tighten the ozone standard in 2014. House and Senate conference negotiations continue and a multi-year reauthorization is expected in early 2014. Formal conference negotiations between the House and Senate continue on the Farm Bill (S. 954 and H.R. 2642) to reauthorize and fund agriculture and food policies. The most current Farm Bill extension expired at the end of September 2013, with the House seeking another extension and the Senate seeking a final bill for congressional consideration in January. Even with the lapse in appropriations, programs are expected to continue without interruption through most of January, at which point the lack of authorizing legislation is expected first to negatively impact the dairy program. Eventually, the lack of authorizing legislation will affect other agriculture and food programs. In conference, several important issues remain to be resolved, including the budget baseline, reforms and funding of agricultural commodity support programs, and reforms and funding of nutrition programs. With regard to the energy title of the Farm Bill, the Senate and House took very different approaches in their respective legislation. While S. 954 authorized energy-related programs at lower funding levels, H.R. 2642 eliminated mandatory funding for these programs all together. Instead, H.R. 2642 leaves funding to the discretion of the normal appropriations process. Clearly, the lack of specific funding levels in the House bill suggests that the majority of House members do not favor funding the energy title of the Farm Bill. In light of this large difference between the House and Senate bills, at best the energy title in the final conference report likely will be funded at significantly lower levels. Federal funding opportunities are likely to be available primarily through competitive grants administered by the Executive Branch departments and agencies. 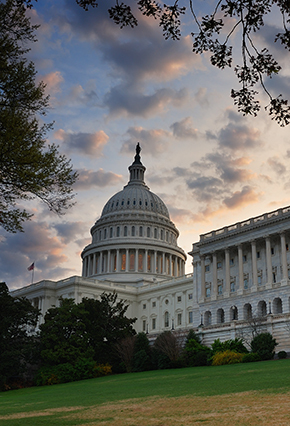 The comprehensive appropriations legislation for FY2014 enacted by Congress during the week of January 13th contained a few directions of funds. However, the general prohibition on “earmarks” in appropriations bills continues. No funding bills for FY2015, except a Continuing Resolution that would fund the government until sometime after the November elections, are expected to be adopted prior to the November elections. As has been the case the last several years, federal funding opportunities will again come this year primarily in the form of competitive grant opportunities through the various departments of the federal government. Van Ness Feldman publishes a weekly Federal Funding Opportunities Update that identifies the opportunities for federal grants that are released weekly by federal departments. An example of this weekly update can be reviewed at http://www.vnf.com/Funding. If you are not now on the list to receive these updates, we encourage you to sign up for this free service today. No federal government shut down or debt default is expected in 2014. During the fall of 2013, a major development was the bipartisan Senate coalition that came together to break gridlock and develop a budget for FY2014 acceptable to both political parties and both Houses of Congress. The budget deal moderated some of the deeper cuts in federal programs required by sequestration. On January 16, 2014, Congress sent President Obama a bipartisan, comprehensive appropriations bill that will fund the government through September 30, 2014. The President signed the bill into law. The final legislation was the product of a “conference” between the House and Senate; the conference was a bipartisan account-by-account review of the funding level of government activities by both the House and Senate Appropriations Committees. The final legislation contained all twelve individual appropriations bills – final passage of which has not occurred for a number of years. This development plus the strong votes of approval in the House of Representatives (359-67) and in the Senate (72-26) could signal the potential for a more bipartisan environment in the United States Congress in 2014. Despite this bipartisan budgetary and appropriations accomplishment, it is still doubtful that Congress can enact, by September 30, 2014, twelve appropriations bills to fund the government in FY2015. Thus, Congress is likely to adopt a CR before October 1, 2014 that will fund the government to some date beyond the mid-term elections. No federal government shut-down is anticipated in 2014. Sometime in February or March of 2014, the nation is likely to reach the limits of its current borrowing authority. There is likely to be a spirited and heated public debate about increasing the borrowing authority of the federal government. In the end, Congress is expected to authorize the President to exceed the debt ceiling, subject to the power of Congress to vote to reject the debt ceiling increase, just as Congress has done in recent years. No federal government default on its debt is expected in 2014. The National Flood Insurance Program (NFIP) will continue to evolve in dramatic ways throughout 2014. Unless Congress acts to roll back the flood insurance rate increases approved as part of the Biggert-Waters Flood Insurance Reform Act of 2012, owners and tenants of properties located in the floodplain will see new, and in many cases significantly higher, flood insurance rates. Reportedly, some property owners have already experienced flood insurance rate increases of 1000%. At the same time that these large insurance rate increases are occurring, the Federal Emergency Management Agency (FEMA) is working on a nationwide Environmental Impact Statement under the Endangered Species Act analyzing the effect of the NFIP and floodplain development on endangered species and critical habitat. Once completed, the EIS and the resulting consultation between the U.S. Fish and Wildlife Service and FEMA is likely to trigger further reforms to the NFIP, including significant restrictions on the future development and redevelopment of floodplain properties around the country. Finally, FEMA is continuing its efforts to update the flood insurance rate maps for much of the country, particularly those areas affected by levees. In general, these new maps are showing larger, deeper and wider floodplains, meaning that more properties than before will be defined as floodplains affected by the NFIP, flood insurance requirements, and corresponding development restrictions in 2014 and beyond. Congress and the Administration will focus on the Affordable Care Act roll-out, efforts to implement the drug traceability law, and reform of the Medicare physician payment system. Implementation of the ACA will continue to be a critical issue for both the Administration and Congress, and 2014 may bring even greater scrutiny on the successes and failures of the law as the political parties focus on messaging for the November mid-term elections. Despite the partisan conflict engendered by the ACA, Congress in 2013 passed bipartisan legislation that creates a national system to trace prescription drugs from the manufacturer to the pharmacy. In the coming year, the Food and Drug Administration (FDA) and stakeholders will be required to work together to comply with the first phase of the law, which goes into effect in 2015. Another issue receiving bipartisan support in 2013 is reform of the Medicare physician payment system, commonly referred to as the Sustainable Growth Rate (SGR) formula. The 2014 budget deal included a three-month extension of Medicare payment rates in order to provide time for the House Energy & Commerce Committee, the House Ways & Means Committee, and the Senate Finance Committee to work on a long-term SGR “fix.” The proposed fix would repeal SGR, move away from the “fee-for-service” payment model and move towards a payment model that rewards hospitals and providers based on healthcare quality measures. The estimated cost of replacing the SGR is $116 billion over 10 years and remains the primary obstacle to moving forward on Medicare physician payment reform. Building on momentum from President Obama’s signing of two hydropower bills into law in 2013 (H.R. 267 and H.R. 678), there is significant industry interest in expanding the reach of hydropower reforms in 2014. The current leadership of the Senate Energy and Natural Resources Committee continues to bring a demonstrated commitment to hydropower and experience in regulatory reform affecting hydropower resources. Senator Landrieu, who is poised to replace Senator Wyden as Chairman of the Committee as early as February 2014, is currently sponsoring land exchange legislation affecting the only state-owned hydroelectric resource in Louisiana. Ranking Minority Member Murkowski brings tremendous expertise in advancing hydropower in her hydro-rich state. In 2014, the initial focus of Congress may be on moving several hydro-related bills that were introduced last session, such as the Bureau of Reclamation Conduit Hydropower Development Equity and Jobs Act (H.R. 1963), which would authorize conduit hydropower development at certain Bureau of Reclamation projects; provisions in the 2013 Water Resources Development Act aimed at improving the environmental review process for certain hydropower projects; and the Marine and Hydrokinetic Renewable Energy Act of 2013, which seeks to improve the approval process for hydrokinetic projects using wave, tidal, and current energy. Beyond these more focused initiatives, continued leadership interest within the Senate Energy and Natural Resources Committee, as well as in the House Natural Resources Committee, may offer other additional opportunities to promote streamlined licensing and development of hydropower resources. The Keystone XL Pipeline saga moves into its sixth year. The outcome remains unclear, but there are expectations for State Department action in the first half of 2014. As of January 14, 2014, TransCanada, which has filed two applications for the presidential permit that is required for the pipeline, is still waiting for the issuance of a Final EIS (FEIS) from the State Department. According to statements by the President, a finding that building the pipeline is in the “national interest” will be based on whether the net effects of the pipeline will “not significantly exacerbate” climate change. The fourth State Department Draft EIS issued in March 2013 again made such a finding. The FEIS is expected to be released after the completion of an analysis by the State Department of whether the same amount of crude from the oil sands would be shipped by rail if Keystone is not built. We believe there is a fair chance that the FEIS will be released in the first quarter of 2014. New White House counselor John Podesta, a vocal critic of the project, has said that he will recuse himself from Keystone discussions. The Administration and Congress each continue to look for ways to streamline the process for National Environmental Policy Act (NEPA) reviews, particularly with respect to energy and water-related infrastructure projects. The Administration has a number of initiatives already under way to prioritize and streamline federal agency reviews for renewable energy projects. In Congress, the ongoing efforts to complete a Water Resources Development Act include an ongoing debate regarding whether to fast-track or streamline NEPA reviews for certain authorized WRDA projects. The Administration in 2014 could announce new or refined initiatives for streamlining NEPA reviews. There also are likely to be further efforts in Congress to spotlight concerns about project delays caused by NEPA reviews that continue to increase in complexity. There is a chance that in 2014 the Council on Environmental Quality (CEQ) will finalize guidance to agencies about how agencies should analyze the environmental effects of GHG emissions and climate change when they evaluate the impacts of a proposed agency action under NEPA. CEQ released “Draft NEPA Guidance on Consideration of the Effects of Climate Change and Greenhouse Gas Emissions” in February 2010. In January 2014, CEQ Chairman Nancy Sutley was reported to have said that she did not know when the guidance would be finalized, but that it remains on the White House agenda. There remains a significant level of uncertainty about the future of nuclear power in the United States. Pending litigation affecting Yucca Mountain, the nuclear waste fee, and confidence in the government’s waste storage program, together may motivate Congressional action in 2014. There may be opportunities in 2014 to make progress on solutions, based on the 2012 report of the Blue Ribbon Commission that address nuclear waste storage challenges. Due to the outcome of several pending lawsuits, Congress may find some motivation to legislate. In a case concerning the collection of nuclear waste fees (NWFs), the U.S. Court of Appeals for the D.C. Circuit (D.C. Circuit) mandated the Secretary of Energy to adjust the nuclear waste fee from 1 mill per kilo-watt hour to zero. It remains to be seen if Congress or the Courts will alter that proposal, but it seems most likely that the NWF will be zero in 2014 and could stay there until a comprehensive new federal nuclear waste disposal strategy is in place. At the Nuclear Regulatory Commission (NRC), based on a 2012 ruling by the D.C. Circuit, no new licenses or extensions can be granted until the NRC issues a new waste confidence determination, which is expected in late 2014 or early 2015. Without a nuclear disposal strategy, it may be difficult for the NRC to withstand a challenge to its basis for a new waste confidence determination. Faced with the prospect of no new revenues for the NWF and a bar on new licenses and extensions, Congress may be inclined to consider new legislation, such as the bipartisan Nuclear Waste Act of 2013 that is sponsored by Senators Wyden, Murkowski, Dianne Feinstein (D-CA), and Lamar Alexander (R-TN). Also, in light of the ongoing problems with nuclear waste disposal and with an interest in finding a way forward for the industry to innovate and resume its role in an “all of the above” energy strategy, we expect the Administration to continue to express interest in small modular nuclear reactors. Oil and gas infrastructure will contend with new environmental regulations in 2014 and will continue to adapt to new sources and market needs. Due to dramatic changes in the U.S. domestic oil and natural gas supply picture, we expect pipeline owners to optimize their pipeline assets by reversing their flow direction or changing the products carried in the pipeline, such as from crude oil to natural gas or vice versa. We expect continued efforts by operators of facilities within the jurisdiction of FERC to seek permission from the Commission to abandon existing facilities or secure amendments to certificates as appropriate. EPA will continue its reconsideration of New Source Performance Standards (the so-called “Quad O” standards for volatile organic compounds) and National Emission Standards for Hazardous Air Pollutants. As a result of the former, “green completions” will be required at all newly-fracked wells. EPA is expected to release soon final guidance on the use of diesel fuel in fracking activities. In addition, 2014 could be the year in which the Department of the Interior finalizes rules for hydraulic fracturing on Federal lands. Another area to watch is EPA’s continuing efforts to apply its “aggregation” policy, under which it treats multiple air pollution sources that are part of a pipeline project as a single source, making it more likely that the project will trigger stringent emission control requirements. EPA’s aggregation guidance for regional offices is under challenge in the D.C. Circuit, National Environmental Development Association’s Clean Air Project v. EPA, No. 13-1035 (D.C. Cir.). Pressure continues to grow on the Administration to develop policies to address methane emissions from natural gas infrastructure. In his 2013 climate action plan, President Obama directed an interagency task force to develop a national methane strategy. So far, there has been little public progress from this initiative. However, 2014 could be a year of federal action on methane. On January 9, 2014, the President launched a Quadrennial Energy Review that will focus on energy infrastructure, which may include consideration of methane emission reduction strategies. Oil and gas infrastructure will also be affected by pressures from Congress to establish permitting deadlines for Federal agencies, particularly FERC, and to finalize pipeline safety regulations that will result in significantly higher capital expenditures for both oil and gas pipelines. The Department of Transportation’s Pipeline and Hazardous Materials Safety Administration will issue significant, wide-ranging rulemakings. PHMSA is expected to issue significant, wide-ranging rulemakings to increase the stringency and broaden the scope of its safety regulations for gas and hazardous liquid (oil, products, natural gas liquids) pipelines. Notable potential changes include broadening the pipeline safety regulations to include currently exempt rural gas gathering lines, broadening the applicability of the integrity management program to include more mileage of gas and hazardous liquids pipelines, and imposing new or strengthened requirements relating to maximum pressure and pipe materials validation and testing, valve automation and spacing, integrity management, corrosion control, leak detection, damage prevention, and pipeline repairs. These potential new requirements flow from congressional mandates, National Transportation Safety Board (NTSB) recommendations, and the agency’s own policy initiatives. Last year saw the issuance of significant FERC final rules addressing NERC reliability standards. These standards related to Critical Infrastructure Protection (CIP) version 5 requirements, Geomagnetic Disturbances (GMDs), and the implementation of NERC’s new definition of the Bulk Electric System (BES) and Rules of Procedure. In addition, NERC proposed, and FERC acted quickly to approve, the retirement of 34 requirements within 19 Reliability Standards, streamlining the standards to remove unnecessary compliance requirements. FERC also accepted NERC’s proposed streamlining of its enforcement documentation for possible reliability compliance violations that pose a minimal risk to Bulk-Power Systems. Registered entities in the electric sector that must comply with the NERC reliability requirements will be faced with the need to complete significant planning work in 2014 to update their compliance programs to address these forthcoming NERC requirements. Specifically, the CIP version 5 requirements will require a major expansion of the scope of compliance requirements before the standards become enforceable on April 1, 2016. NERC also has a significant 2014 agenda ahead to prepare further revisions to CIP requirements, and to develop reliability standards to address the potential impact of GMDs. In 2014, we also expect NERC to take further action to implement its Reliability Assurance Initiative, and additional FERC Rulemakings to further clarify the scope of the BES definition. Expiration of the Renewable Energy Production Tax Credit (PTC) on December 31, 2013, creates uncertainty for investors and developers of renewable energy projects. The debate regarding tax incentives for wind, biomass, geothermal, hydrokinetic, and other renewable technologies likely will continue well into 2014. Although there are no immediate signs of a renewal, the PTC has expired four times since its enactment in 1992, only to be renewed by Congress amid pressure from supporters of renewable energy projects. Without these tax incentives, renewable project developers are likely to rely increasingly on the mandatory purchase provisions of the Public Utility Regulatory Policies Act (PURPA), which require incumbent utilities to purchase electricity from small renewable facilities at avoided-cost rates. Friction between FERC and the state commissions that are charged with implementing PURPA is anticipated to continue in 2014. Other federal actions of interest to the renewables industry in 2014 could include: FERC policy developments on forward capacity markets, transmission planning, cost allocation, and generator interconnection; Department of Defense initiatives on microgrid development and renewable energy procurement; new policy by the Department of the Interior on the siting of renewable projects on federal lands; and funding for research and development initiatives. At the state level, renewable portfolio standards have now been established in 29 states and likely will continue to drive renewable energy project development in 2014. The Social Cost of Carbon (SCC), which involves measuring the economic impact that greenhouse gas (GHG) emissions have on society, has become an increasingly important and contentious aspect of federal rulemaking. In light of the Administration’s move to address climate change through regulatory policy and executive actions utilizing existing legal authorities, expect increased attention on the SCC. The SCC plays a key role in climate change and energy regulation because a high SCC can be used to justify the regulatory benefits of stringent and aggressive GHG regulations, energy efficiency targets, and incentives for low-carbon generation. The Administration recently increased its central estimates of the SCC and has requested public comment on the technical support for its new estimate. Because climate change impacts are notoriously difficult to model and quantify, we expect continuing debate over, and continued legal challenges to, the Administration’s reliance on the SCC for its active climate-and energy-related rulemaking agenda in 2014. Challenges will focus on the technical justifications for the Administration's update of the SCC, as well as the legal and regulatory justification for taking the costs of GHG emissions into account. These challenges could play an increasingly important role as the Administration proposes new rules for regulating CO2 from new, modified, and existing power plants. This will be a pivotal year in the congressional effort either to enact comprehensive tax reform or to enact an extension of the expiring tax provisions, including several energy-related tax provisions. The federal tax reform debate will be affected profoundly by the anticipated confirmation of Senator Baucus as Ambassador to China. Senator Baucus would then leave his chairmanship of the Finance Committee – expected by mid-February – to be replaced as chairman by Senator Wyden. While both Senators support tax reform, Senator Wyden is likely to have different priorities and different preferred approaches to tax reform. Senator Wyden has already expressed an interest in an “extenders” package that would contain expiring and expired energy tax credits. The pace of comprehensive tax reform is likely to slow as Senator Wyden develops his priorities and approaches. Despite this change in chairmanships, we expect in 2014 a continued substantive dialogue on tax reform that includes an examination of all corporate and individual tax expenditures and “loopholes.” Additional tax reform discussion drafts on tax policy issues are expected to be released in 2014 by both the House Ways and Means Committee and the Senate Finance Committee. It is unclear whether both tax committees will develop proposed tax reform legislation in 2014. In terms of tax policies directly affecting the energy industry, we expect Congress to continue examining the tax incentives that are provided to every sector of the energy industry with the goal of “leveling the playing field” among the various forms of energy and reducing tax expenditures. In November and December of 2013, Chairman Baucus issued four legislative discussion drafts that included major changes to the tax incentives for fossil fuel and renewable energy industries. The Chairman proposed to eliminate more than 40 existing energy tax incentives and replace them with two technology neutral tax incentives: one for clean generation of electricity and one for the production of clean transportation fuels. House Ways and Means Committee Chairman Dave Camp (R-MI) said that he intends to release a comprehensive tax reform legislative proposal in early 2014 that can be expected to make dramatic changes in the energy tax arena as part of his effort to reduce the top corporate and individual income tax rate to 25%. It is not yet clear that the Republican House leadership supports this objective of Chairman Camp. Senator Wyden is rumored to believe the Senate should enact a tax extenders bill early in 2014. As a result, there is a good possibility that the Senate Finance Committee could mark up a tax extenders package in the April/May timeframe. At the same time, Chairman Camp has said that he is focused on tax reform and will not consider a tax extenders bill until there is no possibility for tax reform in 2014. Given Chairman Camp’s position, action on tax extenders could be delayed until a lame duck session (post-November election) at the end of the year. We believe, however, that tax extenders legislation will be enacted in 2014. While surface transportation programs expire in September 2014, Congress may extend the current surface transportation legislation beyond the mid-term elections in November. Moving Ahead for Progress in the 21st Century Act of 2012 (MAP-21) authorizes surface transportation programs through September 30, 2014. Leaders of the House and Senate authorizing committees will seek surface transportation legislation that reauthorizes programs for four to six years. However, very difficult issues, such as the continued inadequacy of the Highway Trust Fund, must be resolved before a long term authorization bill can be enacted. This issue is particularly difficult to resolve within the continued framework of sequestration. Based on both the difficulty of resolving major issues that confront the surface transportation legislation and the progress of similarly large funding and authorization bills, like the Farm Bill and WRDA, it seems unlikely that reauthorization of the current two-year surface transportation bill will occur in 2014. Instead, we expect hearings to occur in, and potential legislative drafts to be released by, both the Senate Environment and Public Works Committee and the House Transportation and Infrastructure Committee in 2014, but only a short-term extension of the current legislation to occur this year. SAFETEA-LU, the predecessor to MAP-21, was extended eleven times over a three year period before the new legislation was enacted. Other surface transportation issues that may receive legislative attention in 2014 include reauthorization of the Passenger Rail Investment and Improvement Act of 2008, or PRIIA (Amtrak/passenger rail bill), and the deadline for the implementation of Positive Train Control (PTC). While passenger rail issues were deliberately left out of previous surface transportation bills, the two issues could be combined as the legislative process proceeds. Regarding the PTC mandate, which is very unpopular with the freight rail industry, a recent deadly commuter rail derailment in New York, which reportedly could have been prevented if PTC had been installed, will make any legislation to delay the installation of PTC very difficult to enact. House and Senate conference negotiations on the Water Resources Development Act (WRDA) are continuing and seem to be advancing. Passage of WRDA is likely in the first quarter of 2014. We expect conference negotiations on WRDA will result in legislation that authorizes water-related projects and infrastructure, including flood control, navigation and ports, water supply, environmental restoration, to continue at a strong pace. Several outstanding issues remain to be resolved in conference, however, including the procedure by which projects are authorized. Both the Senate-passed bill (S. 601) and the House-passed bill (H.R. 3080) adhere to the “earmark” ban and do not include member-directed projects. However, a key purpose of WRDA is authorizing water resources projects and the House and Senate take different approaches on this critical subject: S. 601 does not name water projects, but rather, authorizes those projects that have a Chief of Engineers report completed and a positive recommendation from the Assistant Secretary of the Army for Civil Works by the date of enactment. S. 601 also requires USACE to provide Congress with a complete list of all uncompleted, authorized projects and creates a Commission to recommend projects, through a public process, for de-authorization. Congress will have the opportunity to disapprove of any de-authorizations proposed by the Commission. On the other hand, the House bill, H.R. 3080, specifically authorizes twenty-three water resources projects that have a Chief of Engineers report completed and a positive recommendation from the Assistant Secretary of the Army for Civil Works. The House bill does not authorize any unnamed projects that might meet the criteria for approval by the date of enactment. The House bill also requires the Secretary of the Army to identify $12 billion of “inactive” projects authorized under previous water resources bills. After a 180-day period available for congressional review, the projects on the list will be de-authorized. Regarding contributions from non-federal interests, S. 601 permanently extends the Secretary’s authority to accept and expend funds contributed by a non-federal public entity to expedite the evaluation and processing of a permit. The measure creates two pilot programs to allow non-federal interests to conduct feasibility studies and carry out flood risk management, hurricane and storm damage reduction, and harbor navigation projects. H.R. 3080 also authorizes the Secretary of the Army to accept and expend money from non-federal public entities to expedite the evaluation and processing of a permit, noting that public utility and natural gas company projects are covered by this provision. The measure also allows a non-federal sponsor to be a “joint lead agency” for preparing environmental review documents under the National Environmental Policy Act. S. 601 and H.R. 3080 enjoyed broad support in Congress: S. 601 passed by a vote of 83 to 14 in the Senate and H.R. 3080 passed by a vote of 417 to 3 in the House. We believe that when the conference is completed, the compromise bill will receive a similar level of support in each House of Congress, swift passage, and a presidential signature. In addition to the issues we have discussed above, our professionals believe additional issues will begin to emerge and develop in 2014. Sometimes these issues emerge from state and federal litigation, sometimes from studies, or sometimes from first-of-a-kind incidents. Whatever the source, it is critical to be aware of potential impacts and possible trends. Often, new issues can gather force and grow into matters that require focus and sometimes longer term debate and advocacy. Below we identify several issues that we think may gain momentum and require closer attention in 2014. Climate Adaptation – Since some impacts of climate change may be unavoidable, the President’s June 2013 Climate Action Plan suggests that federal agencies may support climate-resilient investment, develop closer coordination between federal and state or local efforts, and decrease vulnerabilities of infrastructure to climate change impacts. There are likely to be federal funds made available to fund local projects. Columbia River Treaty – This year marks the earliest date during which either the United States or Canada may, as a means to seek changes in the treaty, announce an intent to withdraw from the existing Treaty that allocates the use of some Columbia River water for energy production. This statement of intent provides an opportunity to re-evaluate the Treaty to improve certain provisions. Some provisions that the United States may wish to be changed include power sale imbalances between the United States and Canada, existing flood plain protection plans, and the treatment of ecosystem issues in the treaty framework. Disaster Fund Distribution – Federal and state agencies will continue to distribute disaster relief funds to victims of Hurricane Sandy in 2014 and will continue to incorporate lessons learned from Hurricane Sandy and other disasters into the plans for future response and recovery efforts. Future of Infrastructure Funding – Massive investment in infrastructure projects, from transportation systems like highways and railroads to utilities like water, waste disposal, communication and energy, remains a challenge that confronts our nation at the local, state, and federal levels. While no resolution of the funding dilemma is expected in 2014, we expect increased focus on this problem in Congress and in the states. The President’s recently announced Quadrennial Energy Review and other potential Administration initiatives may assist with this need. Louisiana Coastal Damage Litigation – Historically, Louisiana has been a very friendly host to energy extraction and distribution companies. In 2013, the Southeast Louisiana Flood Protection Authority-East brought suit in a Louisiana court against 100 energy companies seeking a massive monetary judgment for damages to Louisiana’s coast allegedly caused by energy company activities over several decades. Efforts by both Governor Bobby Jindal (R) and the state legislature to stop the lawsuit have been unsuccessful. The lawsuit is likely to continue through 2014 and beyond and has spawned similar suits by several coastal Louisiana parish governments. Settlement appears unlikely and no final decision will be rendered in 2014. This litigation is another chapter in the ongoing effort to restore the Louisiana coast and, most importantly, identify sources of funding for the restoration work. State Climate Programs – Although federal climate legislation remains unlikely in 2014, some states will take steps to serve as the primary policymakers to ensure that they reach EPA’s goals for reducing existing sources of GHG emissions. Some states may develop or expand regional efforts, such as the pact between California, Oregon, Washington, and British Columbia, to work together to coordinate climate change mitigation policies.